As the days grow chillier and the Advent season unfolds before us, many churches launch a special sermon series or begin lighting a symbolic candle each week. But First Church of God in Winchester, Kentucky, is hitting the streets. Why? Because they believe in being the church rather than simply coming to church. 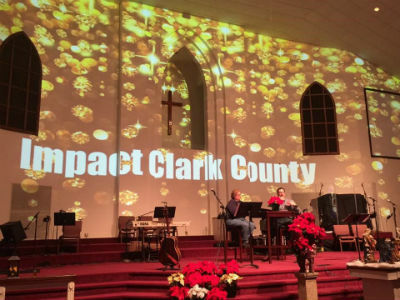 This past Sunday—the first on the Advent calendar—during regular service time, the First Church of God congregation ventured out into the community for the annual Impact Clark County event. 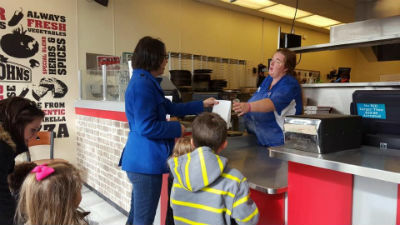 Armed with “blessing bags,” each of which contains a twenty-dollar gift card, information about the church, a prayer from the pastor, and Christmas treats, they were able to meet their neighbors and gift them in some small way. Pastor Allan discusses Impact Clark County from the platform. The timing of this event on the first Sunday in Advent is also very intentional. “We feel it best demonstrates the message of Christ’s love in coming to our world,” says Pastor Allan. Additionally, since it takes place during the Sunday morning service, the congregation is able to specifically minister to community members who aren’t regular church-goers. “In the world we live in today, people have grown accustomed to being judged and condemned,” Pastor Allan says, “but when we love them unconditionally, it allows the Holy Spirit to touch their lives.” He believes deeply in the power of community outreach events like Impact Clark County because it gives his congregation a fresh perspective of what Jesus meant when he said we love God best as we are loving others. In Kentucky, across North America, and around the world, God is on the move in the Church of God. Join the movement. Reach our world. Donate today at give.jesusisthesubject.org. This entry was posted in All Church of God, Southeast and tagged Advent, Allan Hutchinson, blessing bags, Christmas, community, First Church of God, giveaway, Impact Clark County, Kentucky, KY, Megan DeBruyn, outreach, Winchester. Bookmark the permalink.